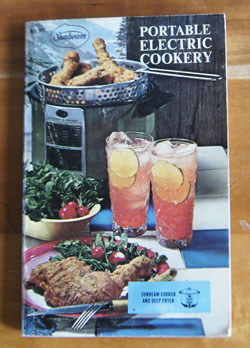 Cookbook #206: Portable Electric Cookery, Bonnie Brown, Sunbeam Corporation, Chicago, Illinois, 1970. I wrote in my database that Portable Electric Cookery “came with my deep fat fryer”, and it has recipes written for deep fat fryers, electric fry pans, blenders, and electric mixers. I covered the deep fat fryer in Sunbeam Cooker and Deep Fryer, the fry pan in Hamilton Beach Automatic Heat Control Appliances, and my old portable electric Sunbeam mixer in Sunbeam Deluxe Mixmaster Mixer. When I opened this booklet this week, I expected it to be “just another manufacturer’s cookbook”. But no, this one is written by a real person, Bonnie Brown, and her personality is reflected throughout the book. For instance, the table of contents is: Appealing Appetizers, Superb Soups, Magic with Meats, Fabulous Fish . . . you get the idea! Cutesy titles repeating first letters. And what of the recipes? Surprisingly, I find some that are interesting. We had “Osso Buco” – braised lamb or veal shanks – at a local restaurant and I made it at home because we liked it so much. The Osso Buco recipe in Portable Electric Cookery includes lemon peel and anchovies – I think we’d like that. Savory Lamb Chops, simmered with olive oil, onion, carrots, tomatoes, sherry, and mushrooms sound good. So do the Lamb Shoulder Chops, Pizza Style (simmered in a sauce and covered with mozzarella cheese). The Perfect Poultry chapter has a lot of recipes for bone-in chicken pieces. Several years ago, stores in my area stopped selling packages of “whole chickens, cut up”, like the “Pick of the Chix” I bought for years. Today I have to buy breasts, thighs, legs, and wings separately, which can be a pain. Or, I have to cut up a whole chicken myself. Anyway, the recipes in this chapter include old standbys like Chicken a la King and Chicken Stroganoff and Chicken with Dumplings, as well as many simmered chicken recipes with a variety of seasonings, like tarragon and ginger. “Flaming Breast of Chicken” is a recipe for boned chicken breasts in a rich egg yolk, mushroom and scallion sauce, cooked in the electric fry pan, and covered with brandy and flamed just before serving. Candied Sweet Potatoes reminds me of the candied sweet potatoes my mother always made for Thanksgiving. I’ve lost her recipe, but the recipe in Portable Electric Cookery is probably about how she made them. Cherries Jubilee is a cooked-at-the-table recipe that would work well using the electric fry pan, in fact, the recipe says not to use a non-stick pan. Briefly, dark sweet cherries are boiled with a bit of cornstarch, then sprinkled with sugar. Then, you cover them with warmed brandy, ignite the brandy, and spoon the cherries over vanilla ice cream. Sukiyaki is a dish I learned how to make from my Japanese college roommate, and I always make it in the electric fry pan. The recipe in ortable Electric Cookery is similar to mine. The Delectable Desserts chapter has an interesting recipe for Baked Alaska. Guess I’ve decided to keep this cookbook. The recipes are from scratch, and include a variety of meats and seasonings influenced by different cultures. I am pleasantly surprised! Most of the recipes, though, I’d cook in my current selection of stove top pans, electric slow cookers, Kitchen Aid mixer, and a food processor rather than a blender. I like the recipe for “Mandarin Beef” in the “Cooking with a Foreign Flavor chapter”. It has a sauce of ginger, garlic, soy sauce, and tomatoes. Tomatoes in a stir fry is a new twist, so I decide to make this recipe for this blog. I don’t feel like pulling out my electric fry pan, so I’ll just use one of my stove-top frying pans. For the two of us, I’ll halve the recipe. Instead of the canned bean sprouts, I will substitute with julienned zucchini (I would have used fresh bean sprouts, but forgot to buy them!). I did have mushrooms, so I used them in this dish. And I’ll use fresh ginger and garlic. Tomatoes and fresh ginger and garlic remind me of the base for many dishes my daughter cooked for us in Togo. I think we will like this Mandarin Beef. Heat a little oil in a wok or fry pan. Add the beef, garlic, ginger, and salt and pepper, and brown the beef over fairly high heat. Turn down the heat and add the soy sauce and sugar and cook and stir about 5 minutes. Add the tomatoes, green pepper, bean sprouts (or zucchini), and mushrooms and cover and cook about 5 minutes. Add the cornstarch/water mixture, and cook and stir until the dish is slightly thickened. Serve over rice (I used jasmine rice). 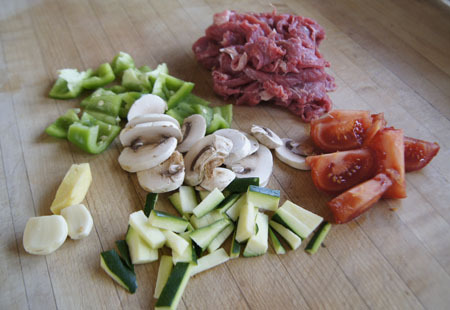 Below is a photo of the meat and vegetables ready for the stir fry. I totally forgot to take a photo of the cooked meal! It smelled so good and we were hungry – that’s my excuse. It was very good and I would make it again. Cookbook #205: Encyclopedia of Cookery, Vol. 10, Q-Sor, Woman’s Day, Fawcett Publications, NY, 1966. I have a set of twelve Encyclopedia of Cookery volumes and this is the tenth of that set – I covered the first nine in previous posts. I’ve enjoyed all of them so far! This volume covers curious and helpful information about foods from (q)uail to (sor)rel. “Quantity cooking” is covered in about ten pages of handy hints, instructions, and recipes. Largely it is for homecooks who need to cook for community events, family gatherings, and bake sales. “Quenelles” are fish dumplings (I made these once, years ago). “Quiche” is “a savory baked custard tart thought to have originated in Lorraine, a province of eastern France bordering on Germany”. The word quiche derives from a word from a French-German dialect that means kuchen, or “cake” (and I have a longing for a kuchen I once had). 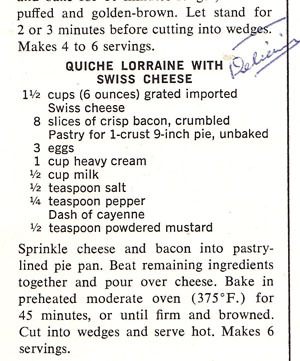 Mother labelled as “delicious” the recipe for “Quiche Lorraine with Swiss Cheese”. Rabbit, raccoon, radish, rampion (a bellflower used for its edibible root and tender young leaves). “Ratatouille” is a stew or casserole that includes eggplant, zucchini, and green pepper. A “Recipe” is: “a formula for preparing a dish. In old-fashioned usage the words ‘receipt’ or ‘rule’ were often used to mean the same thing.” Aha, back to formulas and chemistry. “Reindeer”! I hope I never have to cook one, but at least now I have a recipe. Next is an extensive rice cookbook, with a lot of discussion about preferred ways to cook rice. I like several of the recipes in the cookbook: “Rice and Pork Casserole”, “Ham and Cheese Rice Bake”, “Bok Youguy” (chicken, rice, raisins, peanuts, coconut), “Mexican Rice and Yellow Rice”, and “Ham Jambalaya”. “Rock Cornish Hens, or Cornish Game Hens” are defined as a fowl species bred from the Cornish hen and a pea comb. Today it is defined as a hybrid chicken sold whole. I could try the “Rock Cornish Hen” recipe including pecan stuffing. Romaine is also called “Cos” lettuce. A “Russian Cook Book” offers recipes for fare such as Selyodka (herrings), Ikra Iz Baklazhanov (eggplant caviar), Borsch, and Vatrushki (a cheese and egg tart). “Rye” is a cereal grass and rye flour is used in malt liquors, gin and Kvall (a Russian drink), as well as the rye breads that I know and love. “Saffron” is a spice made from the stigmas of the flowers of a small crocus. I bought some saffron on our trip to Turkey and discuss it in this post on my other blog. “Sago” is a starch made from the sago palm, and is a common food in the southwest Pacific. I peruse the “Salad Cook Book” with recipes for fresh lettuce and vegetable salads through fruit and molded salads. “Salamander”! I read the paragraph under this heading, expecting to learn how to skin and cook this reptile. But no, in culinary language a “salamander” is a kitchen tool used for browning the tops of foods. One version was a long rod, flattened at one end, that was set in the fire and then waved close over the food. It has been replaced by the modern kitchen oven broiler. 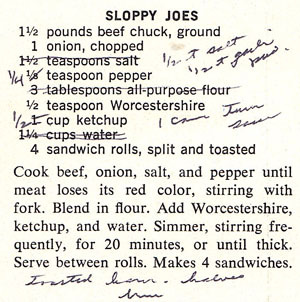 I like a few of the recipes in this section, but like salads, I usually make sandwiches “on the go”, or from ideas picked up from restaurants. Many of the sandwich recipes in this book employ sandwich fillings (kind of like our current-day tuna and chicken salads) that employ a variety of ingredients, including sardines, chopped liver, tongue, or eggs. I might make the “Ham Salad Rolls” 1604, with diced cooked ham, cabbage, celery, green pepper, egg, mustard, and salad dressing on a hot dog roll. There are also recipes for a variety of hot, cold, and open-faced sandwiches. Sardine, sarsaparilla, sassafras. James A. Beard wrote a section on the classic sauces, and Helen Evans Brown wrote a cook book on “How to Cook Superbly: The Basic Sauces, Brown and White”. “Scones” originated in Scotland. “Scrapple”, an invention of the thrifty Pennsylvania Dutch farmers, is a solid mush made from the by-products of hog butchering. 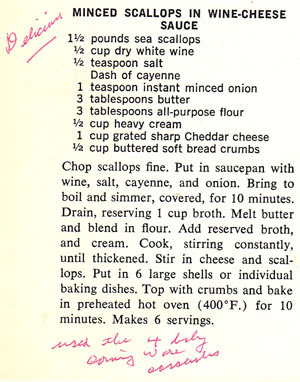 “Seafood” has only a couple paragraphs and just two recipes. “Seaweed” is granted a long two-column essay written by Lucy Kavaler. “Seltzer water” is: “a mineral water containing a great deal of carbon dioxide. It comes from Nieder Selters in the Wiesbaden district of Germany. The name is also now widely used to describe an artificially prepared bottled water of similar composition”. Semonila, sesame, shad, shallot. “Shellfish” includes a handful of recipes, as does “sherbet”. “Shortcake” is a thick cookie made with flour, sugar, sometimes eggs, and a proportionally large amount of butter or other shortening. “Shrimp” has a cook book; “sloe” is the fruit of the blackthorn, and is used to make sloe gin. 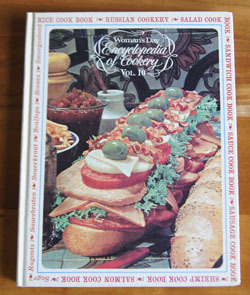 “Smorgasbord” includes recipes for Swedish and American styles of this informal type of food service. Snail, snap bean. A “Snowball” is a round cookie, often rolled in powdered sugar – and I love these! I am tempted to try the recipe for “Coconut Cookie Snowballs” 1668. Soda cracker, soda pop, soda water, sole, sorghum, sorrel (an herb). And thus ends this volume of the Encyclopedia of Cookery. This recipe is real similar to the Encyclopedia of Cooking recipe, but uses butter. Water is eliminated, but the water in the Encyclopedia recipe was used only to dissolve yeast, a step we can bypass today, since the Smitten Kitchen recipe is written for today’s yeast, and yeast is a critical factor in breadmaking. Below is my version, adapted from the Smitten Kitchen recipe. 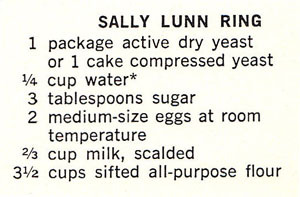 makes one 9×5-inch loaf; double the recipe and bake in a bundt pan for the more traditional Sally Lunn bread shape. In a large mixer bowl, combine 3/4 cup flour, sugar, salt, and yeast. Melt the butter in a small pan and then add the milk. Continue heating, but don’t let it get over about 105˚F. Gradually pour these warm ingredients into the dry mixture in the mixer. Beat for 2 minutes. Add the egg, yolk and another 1/2 cup flour and beat again for 2 minutes. Add the last of the flour and beat until smooth. 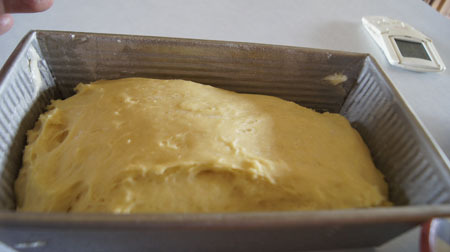 Butter and flour a 9×5-inch loaf pan. Scrape the dough into the pan. Let rise 30 minutes. Bake at 375˚ 35-40 minutes, or until golden to dark brown. 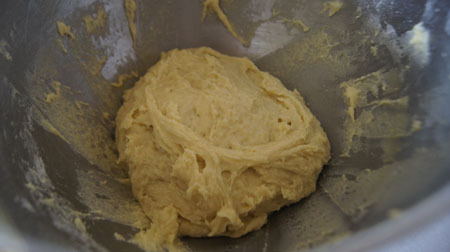 Below is the dough just after mixing, before rising. This is a wet, sticky dough. After the second rise, the dough is not quite to the top of the loaf pan. I let it rise in the pan for 40 minutes because I wanted it higher. Still, I went ahead and put it in the oven. And voila! After baking the bread was just over the top of the pan, and dark golden brown. The crumb of the bread was perfect. 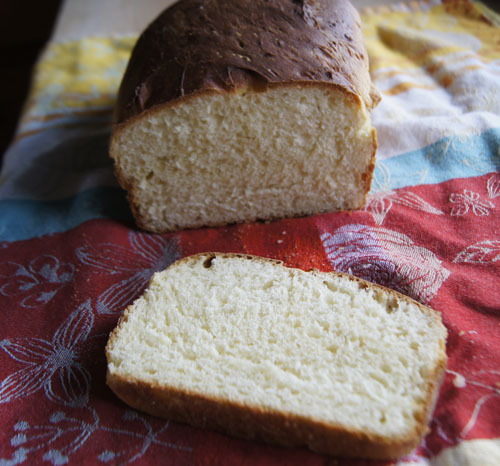 This Sally Lunn bread is rich with eggs, milk, and butter, but not too sweet with sugar. The flavor is reminiscent of a brioche. The “crumb” is between a yeast bread and cake in texture. I served it with a dollop of ice cream and a lot of fresh raspberries for dessert. The next day(s), it was great toasted with jam for breakfast. Yay for Sally Lunn! Cookbook #204: Hershey’s Chocolate Cookbook, Ideals Publishing Corp., Nashville, Tennessee, 1982. 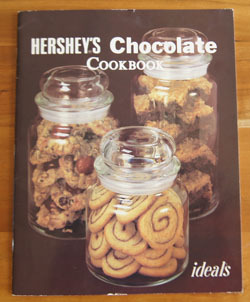 This is one of four Hershey’s cookbooks in my cookbook database. I can’t find the publication date anywhere in my copy, but online photos and details of the same book on Amazon claim “1982” as the date. This Hershey’s cookbook was a gift to my mother from my aunt in 1993. Mother did not mark any of the recipes! 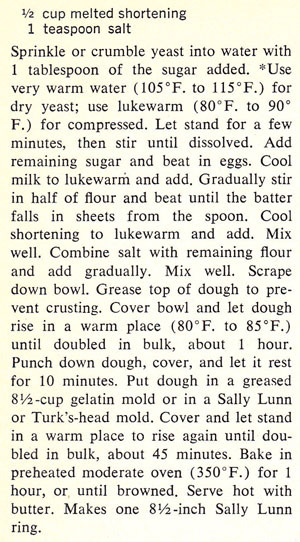 This is unusual for her, especially for cookie, pie, and cake recipes, which include all of the recipes in this cookbook. Many recipes in this cookbook include Reese’s® peanut butter chips. Kind of odd, for a “chocolate” cookbook. Maybe this product was newly on the market in 1982? Because of this ingredient, not every recipe in this cookbook has chocolate in it, which is disappointing! I find that “Reese’s” is (to this day) one of the Hershey brand names. Hmm. This make this a “brand name” cookbook. As I page through this book today, I find a favorite old cookie recipe: Peanut Blossoms. Chocolate Drop Cookies sound good, but I have a similar recipe. I might like Macaroon Kiss Cookies, Crunchy Oatmeal Peanut Butter Chip Cookies, and Chewy Chocolate Wafers. The pie and cake recipes all look good. Cocoa Chiffon-Cloud Pie is one I’ll save, since I once had a yearning for a chocolate chiffon pie and couldn’t find a recipe. Chocolate-Butterscotch Pie with Macaroon Nut Crust and Chocolate Banana Cream Pie, yum. I find “Red Velvet Cocoa Cake”, a recipe I once searched for ( I ended up developing my own recipe for this cake, baked at high altitude). Chocolate Fudge Cake? Who wouldn’t want that? Orange-Kissed Chocolate Cupcakes, where you take a section out of the top of a chocolate cupcake, fill it with orange cream, and top with a Hershey’s Kiss, yum again. In a perfect world, I’d be making and eating desserts like this every night of the week. But alas, it’s not a perfect world. Since Mother didn’t mark any recipes and I simply don’t need more rich dessert recipes, I’ll scan in a few recipes, and then recycle the cookbook. I have kept Hershey’s 1934 Cookbook and Hershey’s Cocoa Cookbook for references to basic chocolate recipes, like brownies, fudge, homemade chocolate syrup, and hot fudge sauce. I’m not sure I’ll always want to make “cookie mix” and then the cookies, so I made a half recipe of the mix, then measured it. It made enough for two different types (or batches) of cookies. Place the flour, the two sugars, baking powder and salt in a food processor. Pulse a few times. 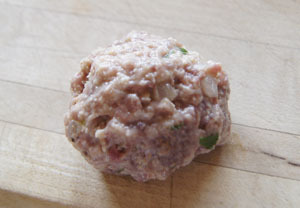 Divide the shortening and butter into chunks and scatter across the dry mixture. Cover the processor and pulse 10-20 times, until the mixture looks like coarse crumbs. Stir the basic cookie mix whit the sour cream, cherries, and chocolate chips. Shape into 1-inch balls, then roll in the nuts. Place on a parchment-lined cookie sheet. 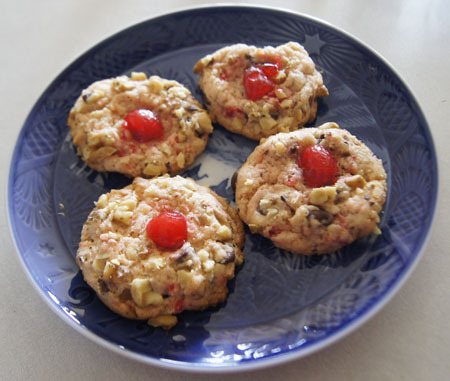 Garnish each cookie with a cherry half. Bake at 375˚ for 12-15 minutes. Wow, were these ever good! Very, very tender. I realized as I made the dough that this is how I make pie crust, by first combining the flour-sugar and shortening, then blending in the wet ingredients. Usually cookies are made by combining the sugar and shortening and any wet ingredients, then adding the dry ingredients. The result of the “Basic Cookie Dough” method is that the cookies taste tender, like pie crust. I learned how to make a very good cookie! There is always something new to learn. 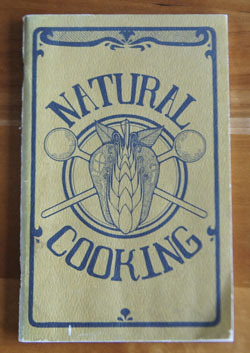 Cookbook #203: Natural Cooking, Barbara Farr, Potpourri Press, Greensboro, NC, 1971. The title page of this booklet is marked “$1.50” in very neat handwriting. My guess is that I bought it in a Boulder bookstore, way back when. Today I could buy it for $3.95 on Amazon. The Owl & Company Bookshop comments that Natural Cooking is a “scarce and relatively early natural food cook-book”, referring to the natural food movement that the “hippie” generation took on as its own. Barbara Farr’s Natural Cooking defines natural foods as minimally processed foods, for example, whole grains instead of white flour, foods grown without pesticides, and produce brought from farm to table as soon as possible. 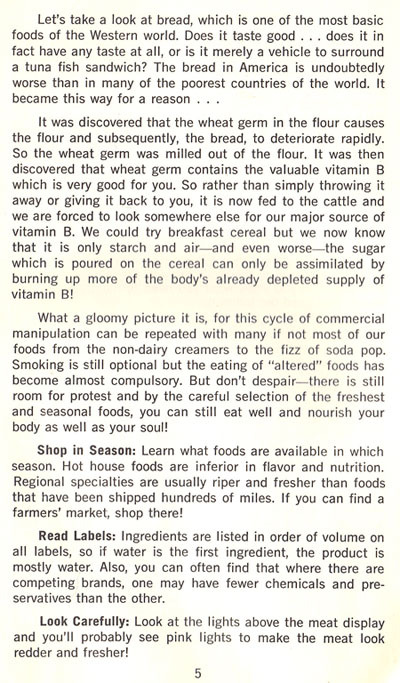 There was a time when all grains and produce were grown without synthetic pesticides, and produce had to be eaten (or home-canned) quickly or it would spoil. In the early twentieth century the “food industry” grew fast, offering food processed to lengthen its shelf life. Home cooks were able to buy canned and packaged foods, and wanted more. Chemists in the same era discovered and manufactured pesticides for greater crop yield, as well as food preservatives (additives) to give processed foods a longer shelf life. Home cooks of the 40s to 50s latched on to these convenient products. The hippie generation did not invent the movement for all natural foods. My edition of the Boston Cooking-School Cook Book, published in 1906, recommends whole grains and a balanced diet including fruits and vegetables. I found Natural Cooking in the bibliography of this book, Secret Ingredients: Race, Gender, and Class at the Dinner Table, by S. Inness. It’s in the chapter “Recipes for Revolution“. The trend for whole grains continues today (2017). I like them because they have much more flavor than plain white bread, or white rice. Whole grains have a low glycemic index, touted in The Glucose Revolution Pocket Guide to Losing Weight as being important both for dieters and diabetics. 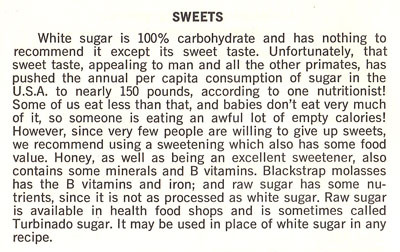 Today, I see “low glycemic index” bars and foods advertised for fitness affectionados and dieters alike. Even though this is a small collection of recipes, it is quite varied. The recipes in this book are not vegetarian and some include cuts of meat that we less commonly use today, such as oxtails, kidneys, liver, and smoked tongue. Hummus, eggplant, stuffed grape leaves, gazpacho, quiche, and bean soups show the variety of choices. I easily find three recipes I’d like to try: Swedish Limpa, a yeast bread made with beer and a larger proportion of rye flour; Turkish Swedish Meatballs made with lots of yogurt; and Apple Krisp, with raw sugar (Turbinado sugar, like I use for Creme Brulee), honey, apples, and wheat germ. 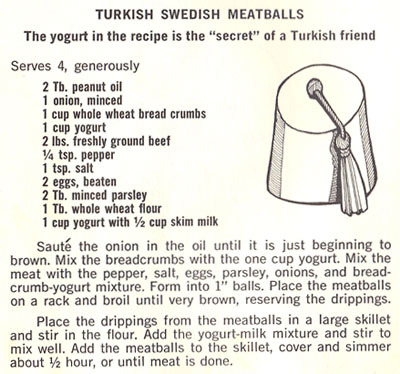 For this blog, I decide to make the Turkish Swedish Meatballs. I cut the recipe in half for the two of us. I found the meatballs too sloppy as I formed them, so I added more breadcrumbs. I found it very hard to stir the whole wheat flour into the drippings, so next time I’d use white (AP) flour. (Not worth the trouble using whole grains for this small amount of flour, if it doesn’t work.) Below is my version of this recipe. Set the meatballs to rest on a plate or breadboard. Heat your oven to broil. Find a clean broiler pan, or use a rack set over a pan to catch the drippings. Lightly oil the broiler pan or the rack, then place the meatballs on it. Broil the meatballs until they are very brown. This took me 5-10 minutes; I rotated the pan often and turned the oven to low-broil about halfway through. Take the pan out of the oven and let it cool. Reserve any drippings for the sauce. Transfer the drippings to a large frying pan pan and stir in the flour (I had so few drippings that I added a bit of olive oil too). Add the milk and stir until smooth. Add the 1/2 cup yogurt. Add the meatballs to the skillet, mix it all together carefully (the meatballs are delicate), then cover and simmer about 1/2 hour, or until the meat is done. Serve over noodles, rice, or mashed potatoes, or maybe a grain like farro, freekeh, bulgur, or cracked wheat. I used whole wheat linguine. I was surprised at how well these went over! The first comment from my dining-partner was “ummmm, these are good!” I too liked them. Full of flavor and nice and moist. Next time I might use a frying pan that goes from oven to stove top. 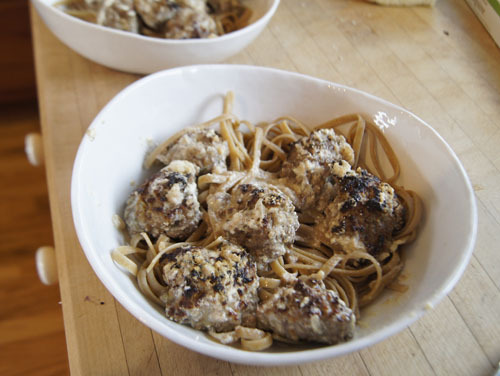 Using the broiler was kind of useless, since very little fat came off these meatballs. But the step of browning under a broiler was nice, because it got these delicate meatballs nice and brown without causing them to fall apart. It kept the moisture of the meatballs inside, and after a good simmer in the yogurt sauce, they were absolutely delicious. I will definitely keep this cookbook!